A 61-yard touchdown as time expired from quarterback Case Keenum to wide receiver Stefon Diggs pushed the Minnesota Vikings ahead of the visiting New Orleans Saints and into the NFC Championship. 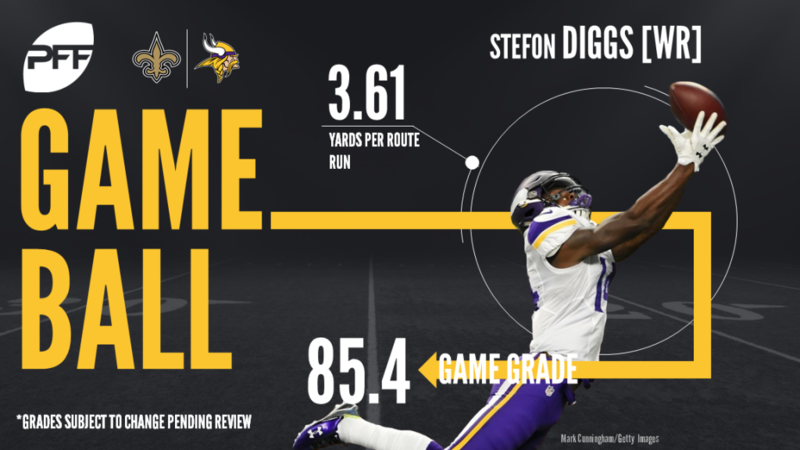 Diggs’ score was made possible by virtue of a missed tackle from Saints safety Marcus Williams, as the rookie’s whiff sprung Diggs loose for the game-winner. Diggs finished the contest with 137 receiving yards on six receptions. Rallying from an early 17-0 deficit, Saints quarterback Drew Brees threw three touchdown passes in the second half to help his team pull ahead in the final minute of regulation. However, the late Keenum-to-Diggs would, of course, have the final say. Diggs was having a nice game prior to the final play, hauling in five catches for 76 yards. But he topped it off by taking advantage of a terrible play by Williams. Diggs also had the awareness to realize he had a straight shot for the end zone and not immediately go out of bounds like he had been anticipating. Most of the Vikings’ offensive line struggled in the run game, but Hill also struggled in pass protection. He allowed one sack, two hits and four hurries on 49 snaps in pass protection. If the Vikings are going to continue winning in the postseason, they will need better performances from Hill and the rest of the offensive line going forward. Sendejo made an impact in the passing game throughout the contest. He took advantage of an underthrown post route from Brees, wheeling and hauling in the interception in the first quarter. For the game, Sendejo allowed just one catch on five targets for 11 yards. Smith played a solid game, making most of his impact around the line of scrimmage. He was targeted just one time in the passing game, giving up one catch for five yards. Smith came free on a well-timed blitz to sack Brees and ended up totaling six tackles and one solo stop when defending the run. Brees shook off a few early mistakes and a tough first half to lead the Saints back in an impressive second half with a number of clutch throws. He finished with two interceptions, one on a badly underthrown post route and another coming off of a batted pass at the line of scrimmage. Brees’ second-half success was largely on his work at the intermediate level, going 9-of-14 for 140 yards and two touchdowns on throws traveling 10-19 yards. Thomas was the big reason the passing game was able to get going in the second half, hauling in 7-of-13 targets for 85 yards and two touchdowns in the game. Thomas was often matched up with Vikings’ Xavier Rhodes, catching 3-of-8 targets for 46 yards and a touchdown when they lined up across from each other. Jordan had an excellent night pass rushing, even if he was unable to bring the quarterback down for a sack. Jordan had eight total pressures, including two hits on 44 snaps rushing the passer. He was also disruptive in run defense, forcing the run away from the intended point of attack on a few occasions to set up plays for his teammates. Te’o has had his ups and downs this year, but he put forth one of his best performances of the season when it mattered most. Te’o had six total defensive stops, a season-high and a number he has reached only one other time in his career. Four stops came against the run, and two in coverage, where he allowed two catches for a total of nine yards.